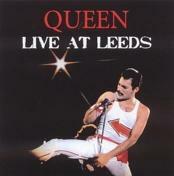 Recorded: Elland Road Football Stadium, Leeds, England May 29th. 1982. Comments: Nice Pro-CDR bootleg from master tape. Nice concert, good atmosphere. I've read that the band had a great evening. One of these 'one off' gigs. I've not come over better recording of this Leeds show. Roots: Original Pro-CDR bootleg. Previously un-released concert. 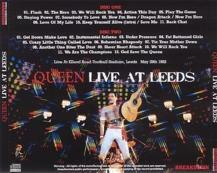 Live At Leeds in the unimaginatively titled release on Breakdown of Queen's May 29th show at the Elland Road Football Stadium in Leeds on the Hot Space tour. The tape is very good to almost excellent being very close to the stage. During the beginning melee the audience are very loud drowning out the music somewhat but by "Action This Day" it is very clear and enjoyable, one of the very best from the UK. Small cuts at the very end of "Somebody To Love" and "Tie Your Mother Down" (where another source is used to for the gap) are the only imperfections on the otherwise complete recording. They began their world tour for the new album in early April and spent two months on the continent. This show was originally scheduled for Old Trafford in Manchester but was changed to Leeds. This was the first of only four shows in the United Kingdom (this, two in Edinburgh and Milton Keynes) making this their shortest ever tour in this region. Three bands, Heart, Teardrop Explodes and Joan Jett And The BlackHearts opened for Queen on this night. Brian May said this is not only one of the best shows from 1982 but one of his all time favourite concerts during Queen's career.